N and I have persevered with the Weekly Watson format after last week’s weird Warm Avocado Veggie Patties. This week’s offering? Well, Watson called it Jamaican Red Bell Pepper Zucchini Eggplant Fettuccine. Another mouthful! 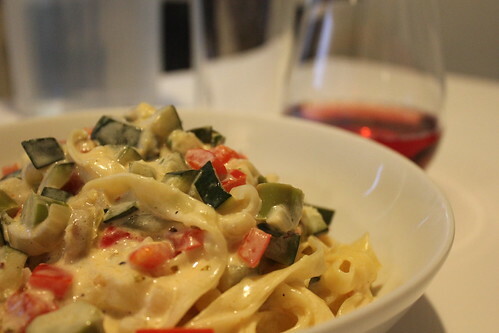 I like to call this one Creamy Veggie Pasta. Notice I took out the Jamaican bit? Well that’s because I have no freaking clue what was supposed to make this dish Jamaican. If using dried morels, place in 2-cup measuring cup and pour enough hot water over to reach 2-cup mark. Let soak pushing down occasionally if red bell peppers rise to top. Drain, reserving soaking liquid; add enough water to measure 1 1/4 cups if needed. Cut large red bell peppers in half. Add zucchini and eggplant and fresh or reconstituted red bell peppers; saute about 6 minutes. Add asparagus and 11⁄2 cup broth (if using fresh red bell peppers) or reserved soaking liquid (if using dried morels. Bring to boil, cover, and cook 2 minutes. Stir in cream and 3⁄4 of the chopped thyme. Simmer uncovered about 4 minutes. Meanwhile, cook pasta in large pot of boiling salted water stirring occasionally. Add 1⁄2 of the mascarpone and sauce; toss. Transfer to bowl; sprinkle with remaining thyme. Yeah. That didn’t fly with me–the instructions just seemed a bit… wonky. So, as with last week’s meal, I changed it up. A lot. I reduced the amount of pasta and we left out the aubergine, much to my disappointment. It seems N is having trouble following the shopping list lately, meaning we’re lacking on certain ingredients, particularly on the veg front. I also added two shallots, a few cloves of minced garlic, chilli pepper flakes, dried oregano and a spritz of lemon. Chop veg and add to pan of hot oil, leaving out the asparagus. Season with salt and pepper. Cook for 10 minutes until veg is soft. Begin cooking pasta according to packet instructions. Add minced garlic and cook for another minute. Add in broth and asparagus and cook for five minutes. Add in cream, thyme, oregano and chilli pepper flakes. Cook for around 5 minutes until asparagus is soft. Finally, add in the mascarpone and stir through until melted. Serve with a spritz of lemon. I’ll be honest, N and I were both, once again, dubious. As we progressed, our confidence grew and N, upon tasting the sauce, deemed it a winner. Thankfully, Watson’s dish was quite tasty and actually reminded me of something from my childhood that I can’t quite put my finger on. I think it might have been one of those dehydrated creamy pasta packets that you add water to and heat on the stove? Maybe? Either way, I think this is one we’ll have again! I’d like to add mushrooms in next time and the aubergine as well. Rating: 75% Delicious (on a rating scale of ‘Delicious,’ ‘Meh’ or ‘In the bin’) Needs a bit of tweaking but one we’ll certainly have again.